(Nanowerk News) The manipulation of light has led to many applications that have revolutionized society through communications, medicine and entertainment. Devices consuming the energy of electromagnetic radiation, such as absorbers and sensors, play an essential role in the using and controlling of light. The researchers at the Aalto University Department of Radio Science and Engineering have demonstrated the first realization of absorbers that do not reflect light over a wide range of frequencies ("Broadband Reflectionless Metasheets: Frequency-Selective Transmission and Perfect Absorption"). All previous absorbers at other frequencies were either fully reflective, as mirrors, or the range of low reflection was very narrow. 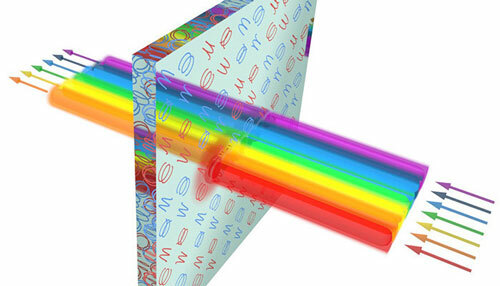 “These absorbers are completely transparent at non-operational frequencies”, concludes researcher Viktar Asadchy. While maintaining efficient absorption of light of the desired frequency, all conventional absorbers strongly interact with the radiation of other frequencies, reflecting it back and not letting it pass through. As a result, they create a reflected beam as well as a perceptible shadow behind and become detectable. The designed and tested structures are able to absorb and sense the light of one or several desired frequency spectra, while being invisible and undetectable at other frequencies. The research has proven that such an unparalleled operation can only be achieved with the use of structural inclusions whose electric and magnetic properties are strongly coupled. These functionalities can lead to a variety of unique applications for radio astronomy and stealth technology. They can also be very useful in everyday life. For example, they could be used in screens that can filter any cell phone signals and pass through Wi-Fi and other microwaves. “This research will also open new venues for general light control and enable novel devices such as flat lenses and light beam transformers”, explains Asadchy.